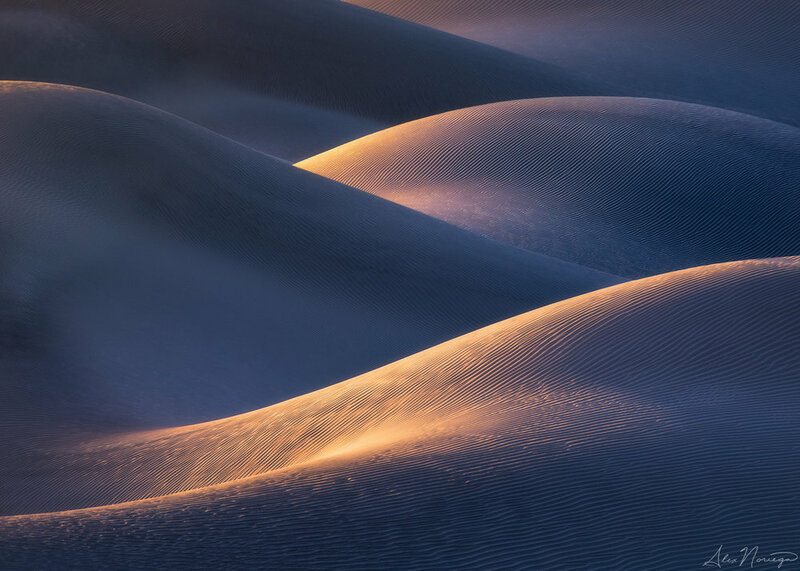 Join Alex Noriega and TJ Thorne on a workshop through the diverse landscapes of eastern California. 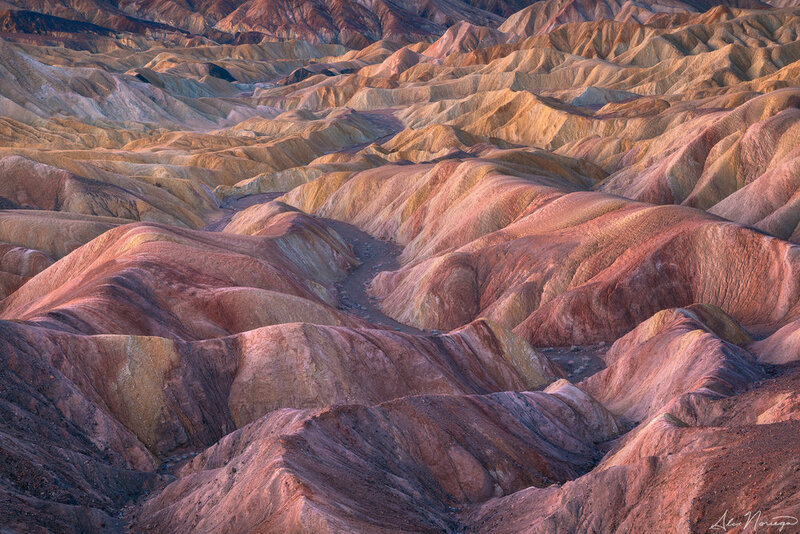 Immerse yourself in an adventure across this uniquely photogenic confluence of desert and mountain landscapes. You will enrich your soul, connect to the land, and grow as an artist while also learning the most advanced techniques for capturing the highest quality images possible! This page is a general overview of the workshop. Upon signup, participants will receive an in-depth brochure containing much more information. You can make your deposit payment towards the bottom of the page. Please do not hesitate to reach out with any questions! You can use the contact page to do so. Our meeting point will be Furnace Creek in Death Valley which will act as a base camp while we venture to various locations within the park. Sand dunes, salt flats, canyons, badlands, and mountains are the main subjects here before we head to the Owens Valley which is nestled between some of the highest peaks in the country (the 14,000+ foot snow-capped peaks of the Eastern Sierras) to the west and the White and Inyo Mountains to the east. Here we will photograph winding rivers below jagged granite mountains, colorful foliage in warm light, and the amazing granite formations of Alabama Hills backdropped by the stunning Mt. Whitney. Our itinerary for this tour will be flexible in order to chase weather, light, and conditions as they occur. We'll use our experience to put you in the best possible position to make compelling photographs. 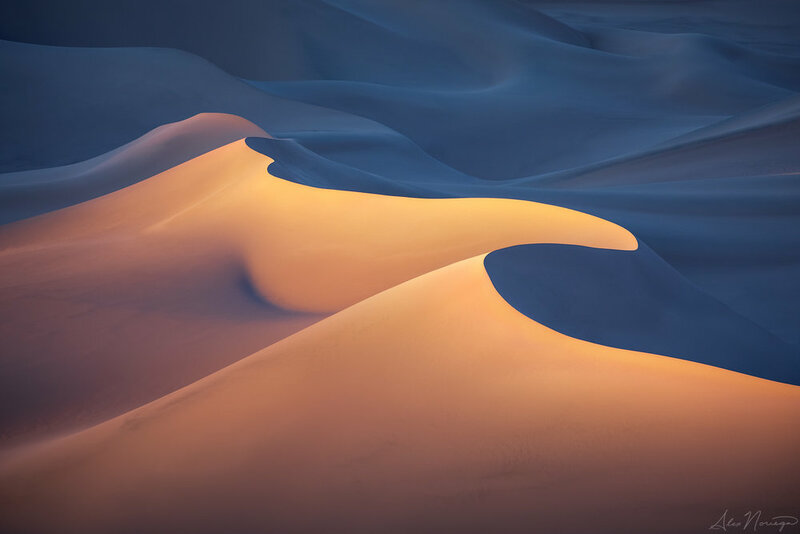 You will not only be guided to the best photography locations that the deserts of eastern California have to offer, you will also be guided through the entire process of making compelling photographs. From in-field techniques to photo processing, you will be instructed on choosing the best compositions, how to best utilize different types of light ranging from subtle to dramatic, how to capture the proper amount of dynamic range and depth of field, how to approach raw conversion, blending, sharpening, and artistic choices—the whole nine yards! 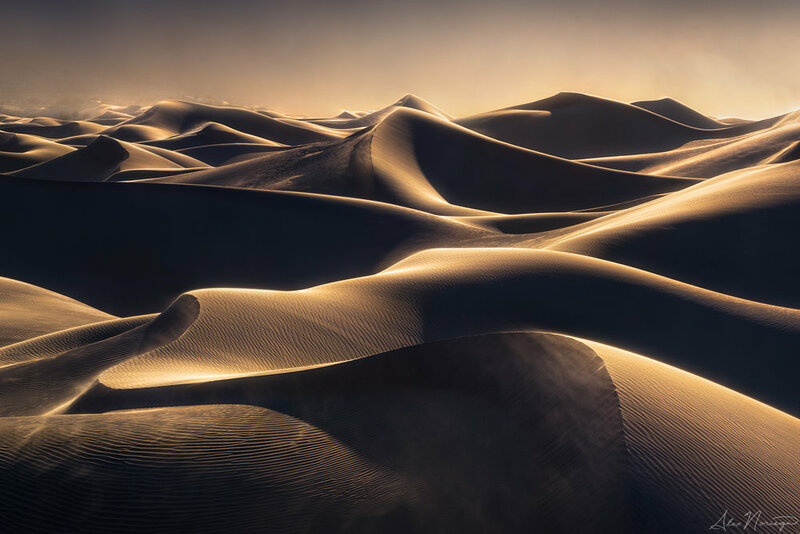 Learn master processing skills from Alex Noriega and discover valuable tools which help you to take complete control over the processing of your images. Instruction goes far beyond the basics, although those who need more basic instruction will certainly be accommodated. Expert guidance to the best photography locations in the Eastern Sierra and California Deserts. Visual exploration of the scene to identify compelling compositions that tell a story. Thinking beyond the obvious to create unique images that you are personally connected to. Creative use of every kind of light from soft to direct to backlit. We will explore the potential of all kinds of light and not rely solely on sunsets and sunrises. Everything technical: compensating for high dynamic range, focus stacking, exposing to the right, reading your histogram, tricks and tips for proper focusing, full manual control of your camera, and everything else! In-depth processing instruction including everything such as raw processing, blending exposures using luminosity masks, focus stacking, artistic finishing touches in photoshop, and preparation and sharpening for web and print. The processing session will be recorded for you. Guaranteed adventure with two laid back instructors who are eager to share their knowledge and help you grow as an artist and person. We highly recommend purchasing Travel Insurance to protect your investment in the event of unforeseen circumstances. The ability to hike 1-2 miles (1-3km) on uneven terrain. While the majority of the workshop is going to be on easy-moderate surfaces for a novice hiker, the following hazards may be encountered: loose/rocky soil, steep hills and drop-offs, mud, steep sand. Clothing to accommodate a wide range of temperatures. During February we've experienced weather as warm as 80ºF (26ºC) in Death Valley down to 15ºF (-9ºC) in the Owens Valley. It is highly advised that you have proper attire consisting of non-cotton outdoor dedicated clothing, including an assortment of layers to keep you warm at the lower temperatures while allowing you to shed layers as the day warms up. Warm hats, gloves, and boots are highly suggested, as well as a wide brimmed hat, sunscreen, and sunglasses to shelter you from the sun in Death Valley. Water and snacks. While services and provisions in Furnace Creek and Owens Valley are available, there may be days where we are far from civilization with food and water being unavailable. Your Camera. You can choose to use any camera you like, but a digital camera with full manual control and interchangeable lenses is highly recommended and give you the best experience. It is advised that you fully understand how to operate your camera. Lenses. There are opportunities to use any focal length possible, so bring all that you can, wide to long. 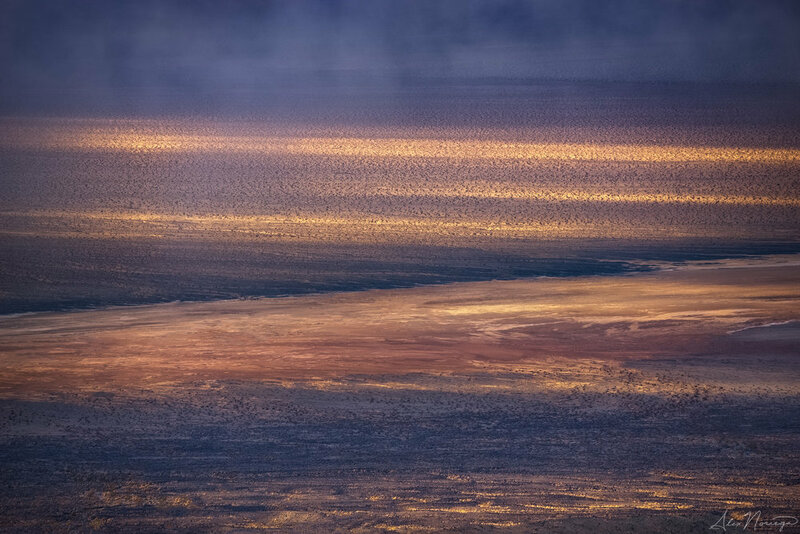 With Death Valley being so vast and full of textures, there are possibilities for 400-600mm shots. We recommend renting a long telephoto if you do not own one. Tripod. We will often be shooting in low light, requiring longer exposure times. Filters. Generally all you will need to use is a polarizer and neutral density filters. Although, it is possible to get great shots without either. Other gear. Several batteries, plenty of memory, a remote trigger, lens cleaning supplies (we highly recommend kimwipes). Clothing & shoes. Weather conditions in the Eastern Sierra and desert during this time of year can be quite cold. Insulating Layers! A good set of base layers, layers for warmth such as fleece and down, and shell jacket and pants. Good hiking boots or shoes are advised along with a warm hat and gloves. Tent and sleeping bag. We may spend one or two nights in a remote area, in order to have early-morning access to potential Milky Way and sunrise shooting. If you're able to sleep in your vehicle, a tent won't be needed, as we'll be driving these remote locations. Snacks and hydration. Maintaining energy and hydration is very important when out in the wilderness. Energy bars, nuts, seeds, and water are recommended. At times we could find ourselves in very remote areas, hours from the nearest store, so a good stock of snacks is highly advised. “They say to never meet your heroes, but I forewent that advice and joined one of Alex Noriega's photography workshops. I've been a huge fan of his photography and postprocessing tutorials for years, but had not yet learned from him in the field. In this case, meeting my hero was not disappointing at all - it was reaffirming! Anybody can teach you the "where," "when," and "what" of nature photography by taking you to the same old viewpoints and pointing out "the shots." What puts Alex head and shoulders above the rest is how capable he is at teaching the "how" and the "why" of making impactful, unique, and creative photographs. I came away from his workshop with a pile of images I am really proud of, but even more valuable were his versatile teachings that I will be able to use in the future in any other situation. I appreciated how generous Alex was with his constructive critique and how he gave it in a way that was very clear and immediately actionable. He gave his students his full attention at all times, and only used his own camera for instructive purposes - he never went off on his own to make his own images. Alex is a master of composition and emphasizing light in any conditions, which is really the secret sauce of nature photography. Additionally, he teaches his postprocessing techniques in a really straightforward way that emphasizes the artistic vision in the field. I was surprised at how simple it was to get great results with his methods. Much like in the field, he excels at teaching why he does what he does; he doesn't just give you a fish, he teaches you how to fish! "I can't thank you enough for providing an adventure of a lifetime. I have been on a few workshops over the past 4 years and I must say this was by far the most professionally run workshop. My experience during this past week far exceeded my expectations!! Your knowledge of photography and willingness to share your passion and love for the outdoors is second to none. The sights, sounds, hikes, conversations, your patience, attention to detail, sense of humor and willingness to teach myself and others have given me memories for life. Your command for PS post processing techniques were very impressive, informative and the added touch of providing us the video and audio will be an invaluable teaching tool. I am so happy that I can do my little part in helping you follow your dream." Death Valley Only Session: A nonrefundable deposit of $495 will be required upon sign up. The balance of $1,200 is due 45 days prior to the date of the workshop (Sept. 27, 2019 for the November 2019 Session). Death Valley and Eastern Sierra Sessions: A nonrefundable deposit of $695 will be required upon sign up. The balance of $1,495 is due 45 days prior to the date of the workshop (Sept. 27, 2019 for the November 2019 Session). After deposit is paid, payments on the balance can be made at your convenience. Cancellations that occur 90-45 days before the start of the workshop will forfeit deposit. Cancellations that occur within 45 days of the workshop will forfeit their full payment. There are no exceptions to these terms. You can make your payment below. After payment is made, a PayPal invoice will be sent so that further payments are simple and easy.